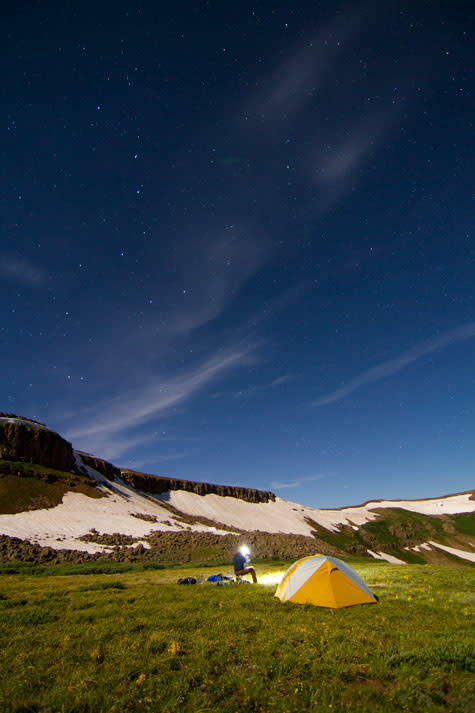 Connect with the ground beneath your feet and feel closer to the stars when you head off into the wilderness for a camping experience in Steamboat Springs and the Yampa Valley. Vast forests, glimmering lakes and scenic views offer the perfect setting for your tent or camper. If you’re traveling with an RV, there are campgrounds for you in Steamboat Springs and outside of town at parks like Stagecoach State Park and Steamboat Lake State Park, both of which offer lakeside campsites that can serve as a home base for your adventures on the water. The U.S. Forest Service lands surrounding Steamboat are home to a variety of camping options, ranging from remote and secluded to car camping-ready with amenities like restrooms and water hookups. These campgrounds make for the ideal escape into the mountains, and can serve as a starting point for mountain biking, hiking and horseback trail riding adventures. State parks like Steamboat Lake and Pearl Lake offer convenient car camping, as do campgrounds along U.S. Highway 40 on Rabbit Ears Pass and Seedhouse Road in North Routt County. The Zirkel and Flat Tops Wilderness Areas are pristine expanses accessible by backpacking only and offer days upon days of beautiful hikes. When the sun fades from the sky and your legs are starting to tire, set up your tent and lay down your head anywhere you’d like. Next to a high alpine lake or deep in a forest, you’ll feel more connected to nature than you’ve ever imagined. There’s no Steamboat summer experience quite like sleeping under the stars. Across the Yampa Valley, camping opportunities range from campgrounds with full amenities to a true wilderness experience in the Routt National Forest and designated Wilderness Areas. From car camping to packing a tent deep into the woods, explore the great outdoors and seek adventure with Steamboat’s vast camping options. Please note: overnight car camping or RV camping within the city limits of Steamboat Springs is prohibited except for the KOA Campgrounds. Please see below for details. Always check closures of campgrounds as seasons can vary. For more information call the Steamboat Chamber at (970) 879-0880 or email info@steamboatchamber.com. You may also visit the U.S. Forest Service office in Steamboat between 8:00 a.m. and 5:00 p.m., Monday through Friday for additional and updated information on campsites and trails or give them a call at 970-870-2299. Please note that all reservations must be made online. Colorado State Parks Passes for 2017 range from $3-7/day or $70/annually. You may purchase passes at the Steamboat Springs Visitor Center, or at the individual parks. Looking for a more rustic experience while in Northwest Colorado? Be sure to peruse the cabin options both near town and tucked away up north. How about a privately catered mountain chalet or a riverside cabin for a more rustic experience? Create your own unqiue adventure with cabins just feet away from Steamboat’s natural hot springs. A Steamboat Springs cabin can help your tailor your vacation perfectly to your desires. Plan your stay at one of our Steamboat Springs cabins below.